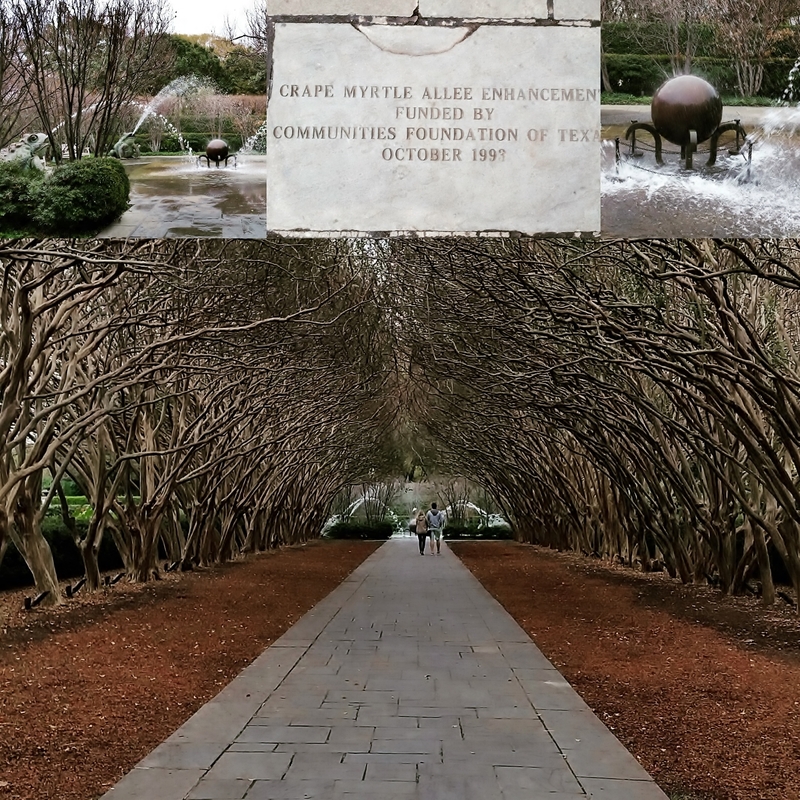 Our Weekend in Dallas the Highs and Lows – finally visiting the arboretum. Today I am still processing the events of this weekend. 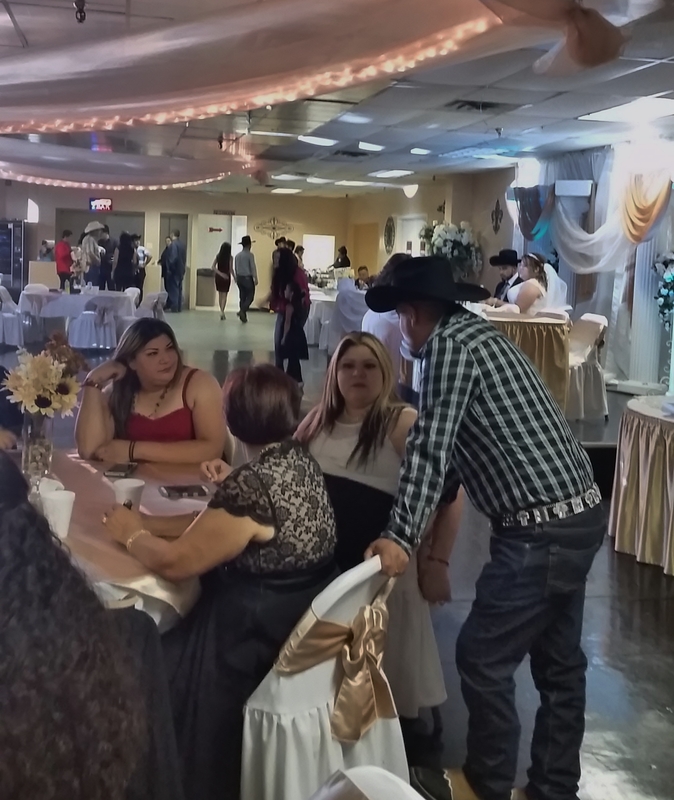 We headed to Dallas to attend the wedding of one of our crewmen. He has been with us since the beginning of starting our business. 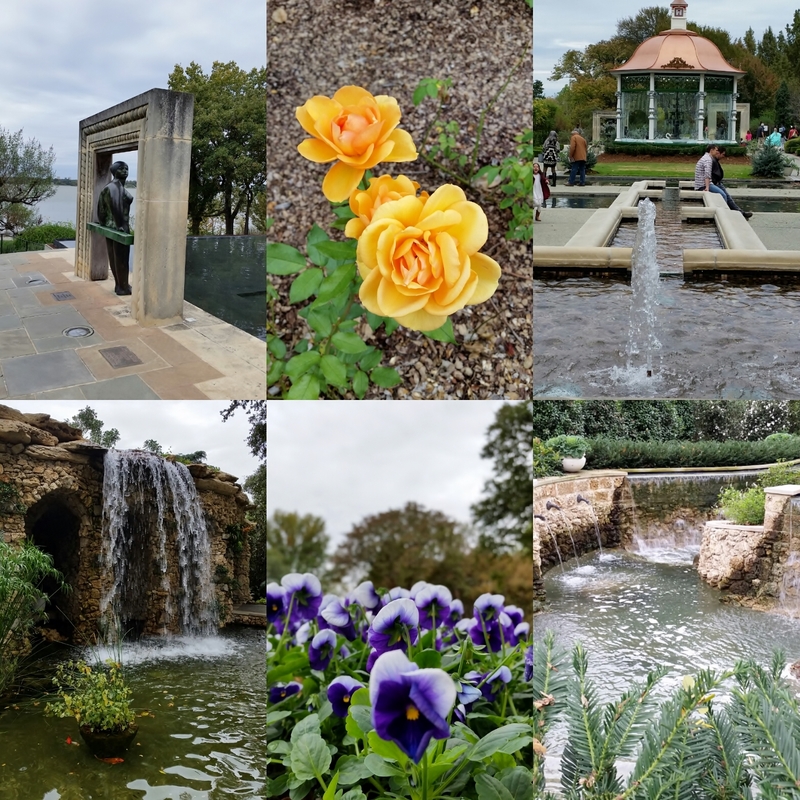 We decided to make it a long weekend so we could finally get to the Dallas Arboretum. 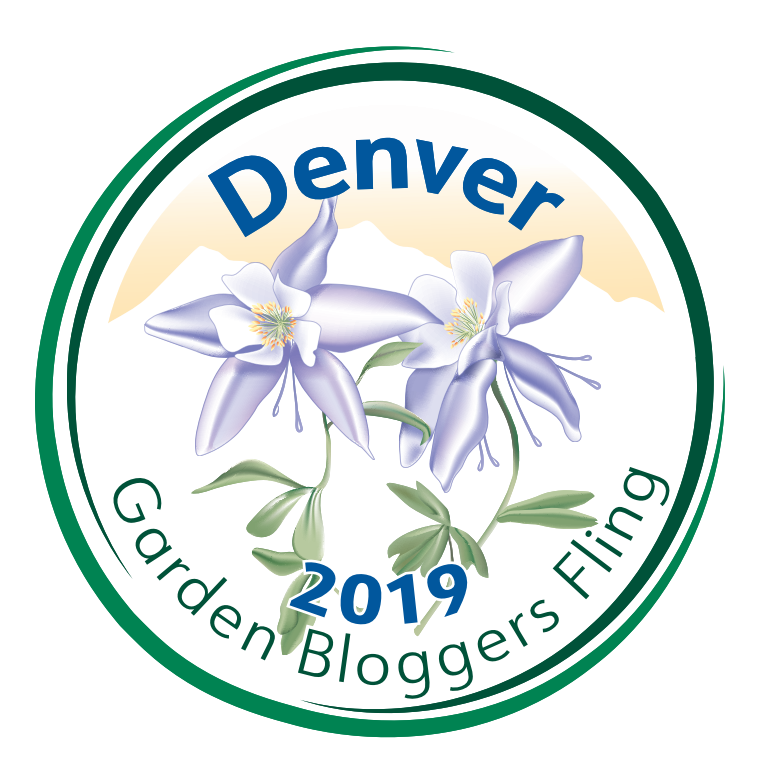 The idea was to spend the early part of the day Saturday touring the garden before getting ready for the party. We left Friday afternoon and enjoyed the sun setting in the west as we headed north on the 45. This, in itself, was a treat for us. 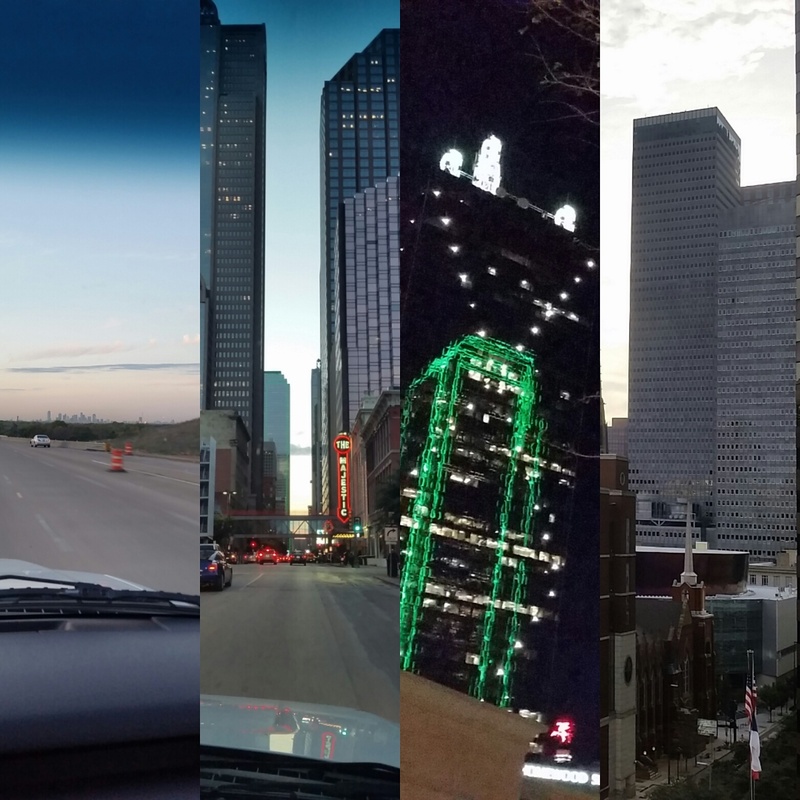 Sunsets are not easy to see in Houston because it is so flat with many tall buildings. We got into Dallas just in time to check into the Fairmount and head to our 6:30 pm dinner reservation at the Y.O. Ranch Steakhouse. It was such a pleasant evening we walked to the restaurant and back. Here is the photo collage I did on Friday evening. 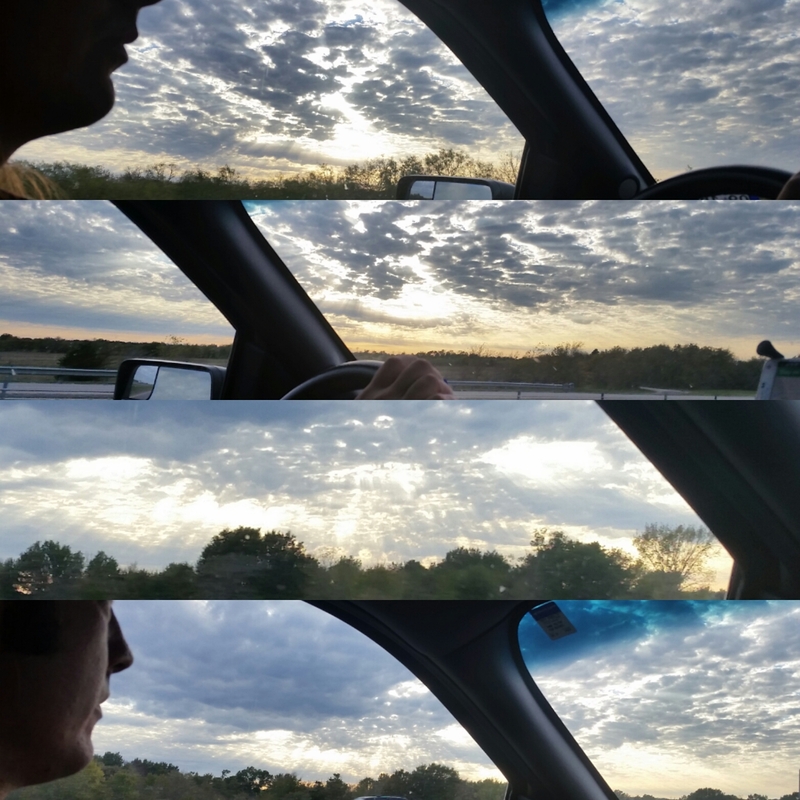 I have found taking pictures with my phone and connecting them in a collage a fun and creative outlet. I especially like reflections. Clouds, skyscrapers and reflections. The city looks so distant in the photo and it was only a few miles away! As we headed to bed Shawn asked if I knew what happened in Paris; he saw some fragment on social media. I said, “no, but let’s turn on the T.V.” He suggested we leave it till the morning since we had been up since 4:30 am and really needed some sleep. 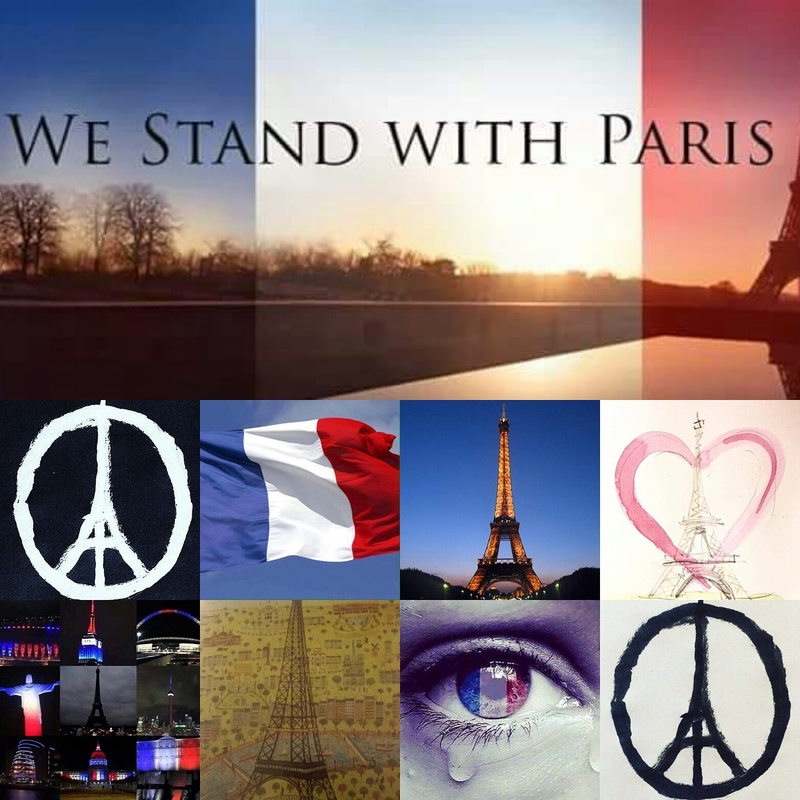 As you all know the morning brought very sad news from Paris that unfolded throughout the day. This really dampened our spirits and we spent most of the day trying to process what happened. We usually work Saturdays and it was so odd to have no work calling us and being in a hotel meant no chores either. So we found ourselves ordering room service and watching the news, researching online and having a rather deep discussion about culture, religion, politics, borders and angry young men. We heard a word that Shawn explained as a pejorative name used for ISIS: it was DAESH. Googling it we found an article on Rational Wiki that gives a lot of interesting information. We also kept checking Facebook which was alive with imagery and solidarity. I started collecting the images and made a few collages to share via Instagram. I guess it was my way of connecting and grieving! We now have a much deeper understanding of what/who ISIS is and how they are funded and what a real danger they are to peace around the world. I don’t generally watch the news and try and read to stay up via sources I find less biased. I learned quite a lot on Saturday. Finally we had to turn it off and get our heads around going to the wedding to celebrate with our valued friend and team lead. Here is Shawn all decked out for a night of celebration. 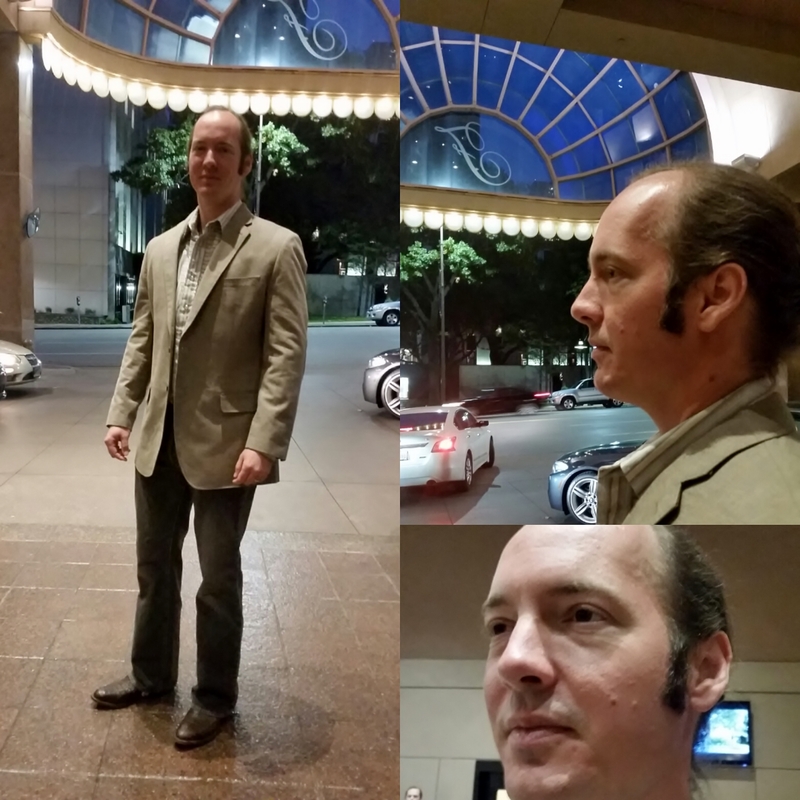 I found this native Texan looking very handsome in his sports coat, jeans and boots. All he needed was a Stetson. 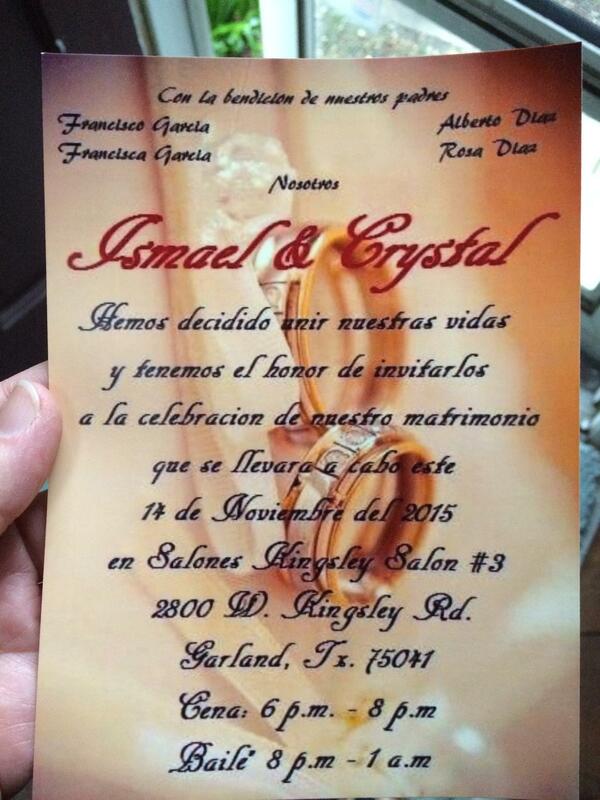 The ‘wedding’ was actually more of a reception after a private ceremony. Everyone was dressed beautifully and ready to celebrate. It started with a buffet dinner. We sat with Alfredo (the other man that has been with us since the beginning), his wife Gabby and their family. I loved the music, it reminded me of home (San Diego): a mix of pop, polka and pan pipe. We didn’t stay to dance and everyone was a bit more somber than they should have been. For me it is hard to dance with a heavy heart. I think the real party didn’t get going until later since many people were just arriving as we left. 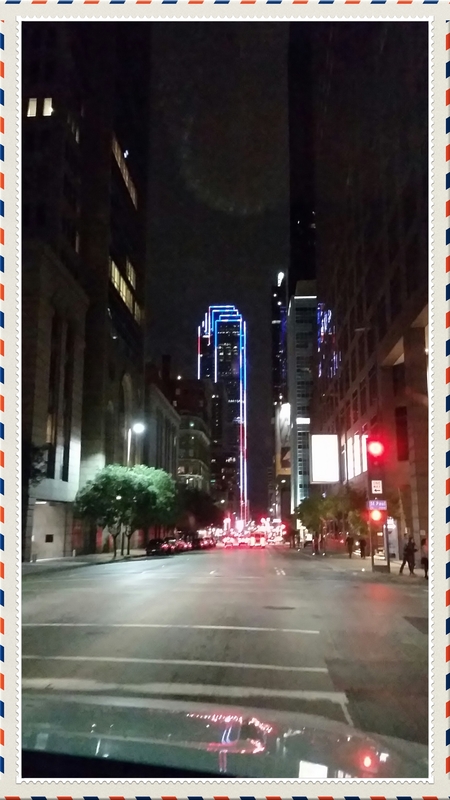 As we drove back to the hotel through downtown we found the whole of Dallas was mourning with many buildings lit up: one with the French flag and others with lights in the colors of the flag. Here is my postcard capturing the moment! Sunday found us packing up to check out. 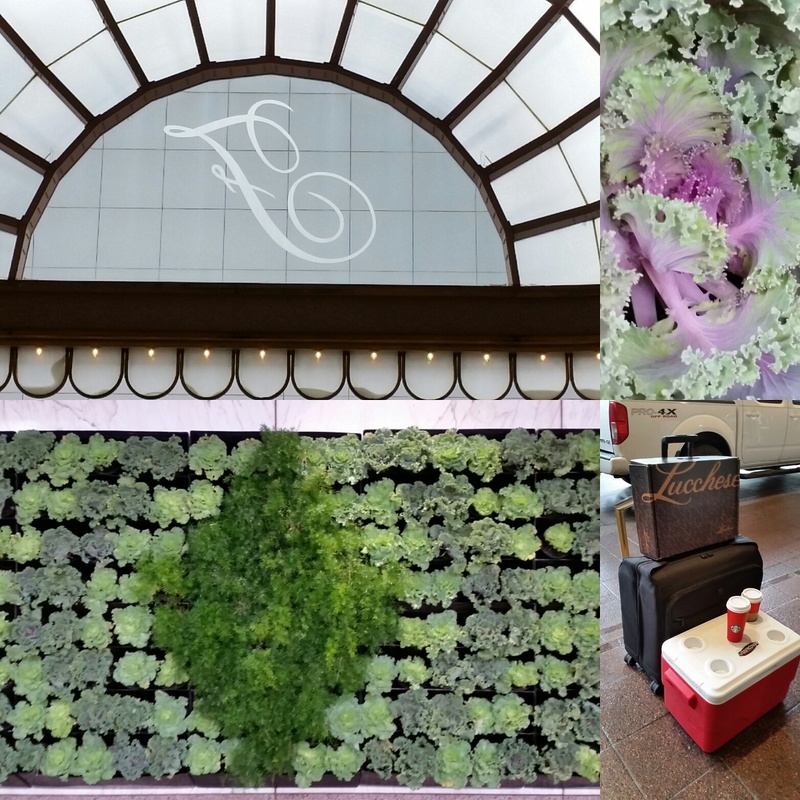 While waiting for the truck to be brought around I did a little collage including the green walls in the entrance. 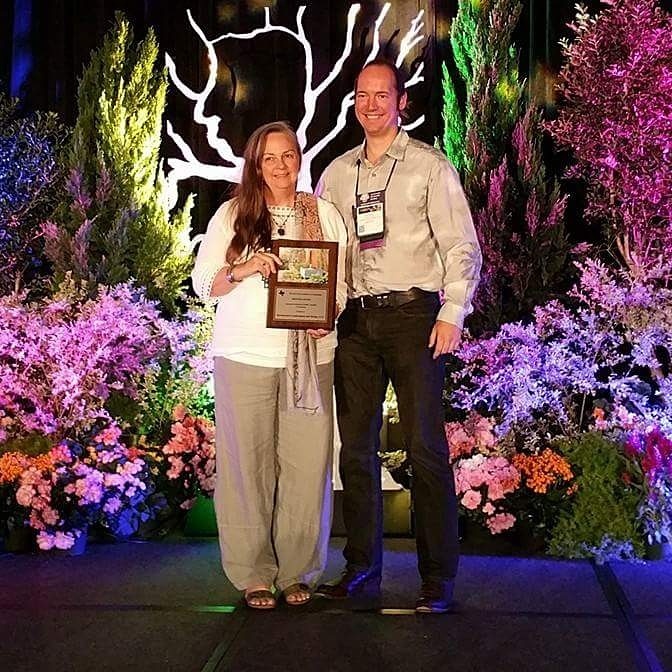 Last time we stayed here for the TNLA expo we went up and toured the roof garden. The Fairmount takes pride in serving locally sourced food and the restaurant is quite good. 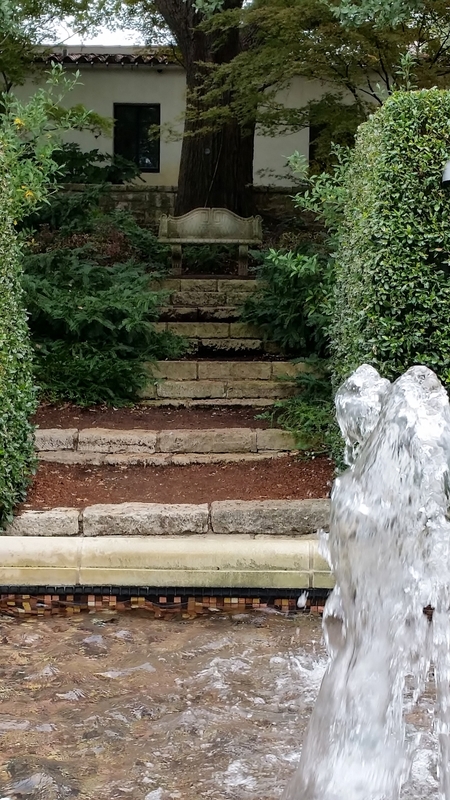 Finally, we headed to the Dallas Arboretum. A cool front was beginning to blow in and it was a gray and blustery day. As we entered we found out that they had just set up their Christmas displays. We enjoyed the Victorian style gazebos with scenes and music from 12 Days of Christmas. The gardens were also still full of tropicals and beautiful flowers. I had to wonder how long they will last when winter arrives. There were many families with young children enjoying it all! 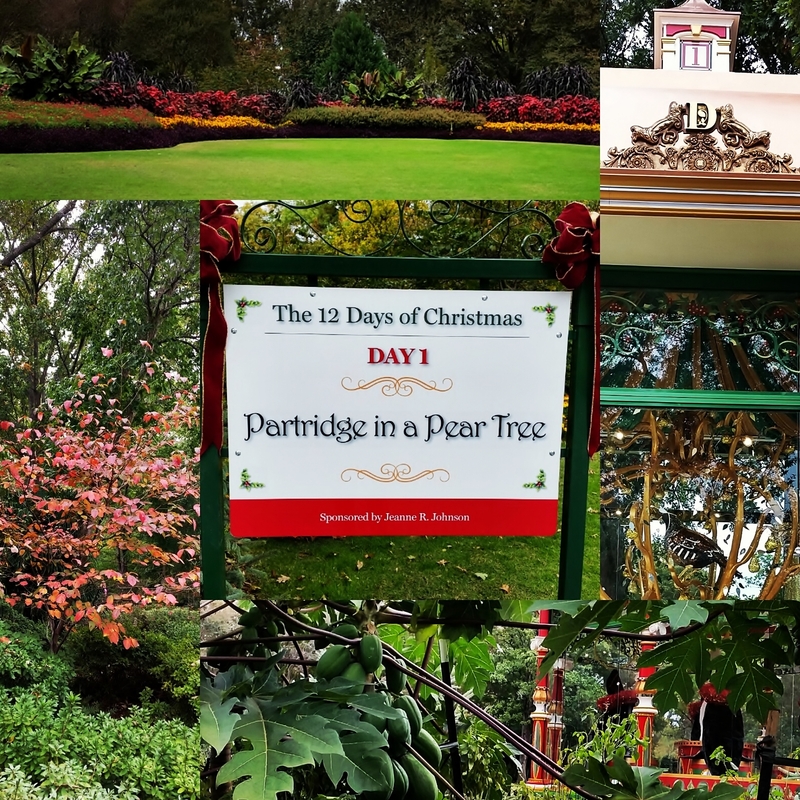 I enjoyed the Christmas music and displays but more so the beautiful beds of color. 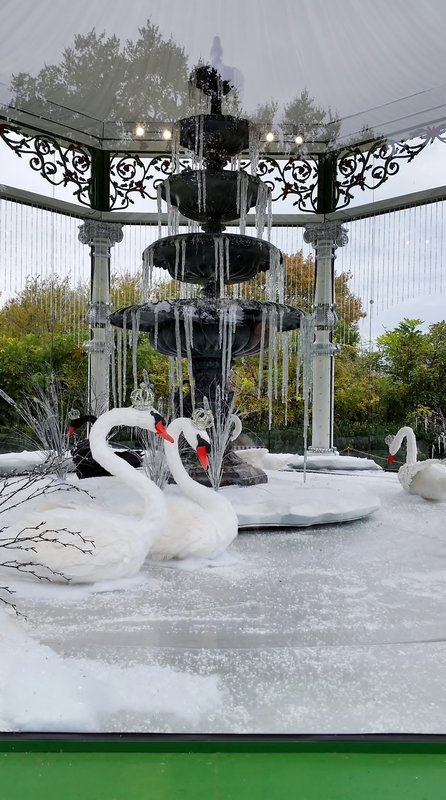 I did have to take a picture of the swans since it is the Lindsey family bird. Seven Swans a Swimming. 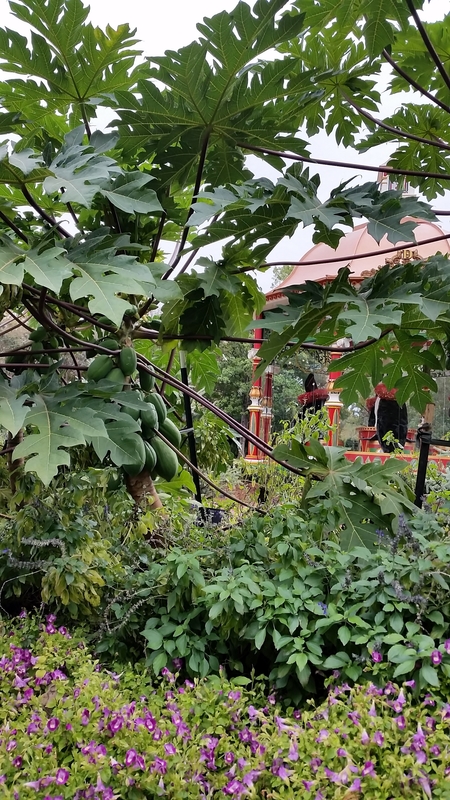 I enjoyed the contrast of the large papaya tree with the winter scene in the gazebo in the background. Along with paths and water features there where plenty of benches so you could sit and enjoy the gardens and the passers by. 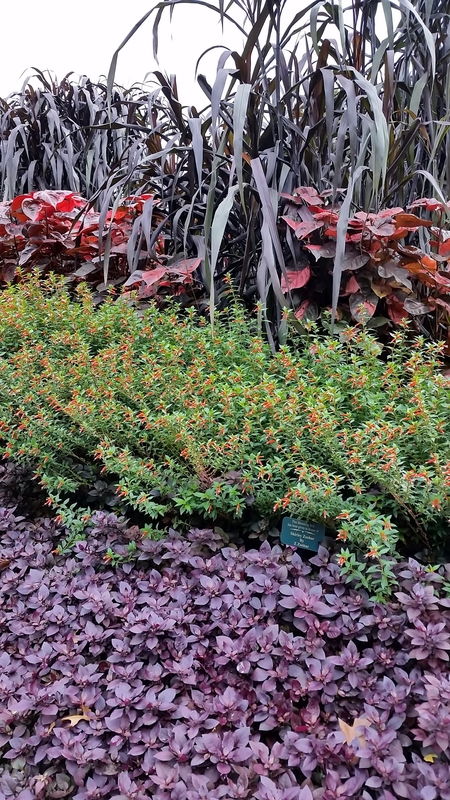 The rich colors and layers in the beds were especially stunning on this gray day. Shawn is a bug whisper and gets the most amazing photos of all variety of insects with his phone’s camera. 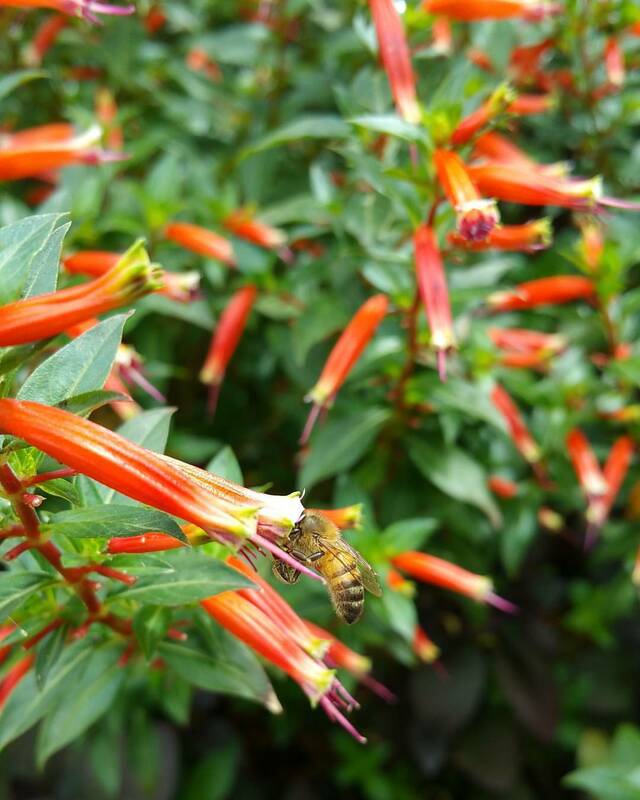 This bee with his head in the flower of the Cigar Plant, Cuphea melvillea sipping nectar is a good example. This is a lovely big garden that is designed to walk through. 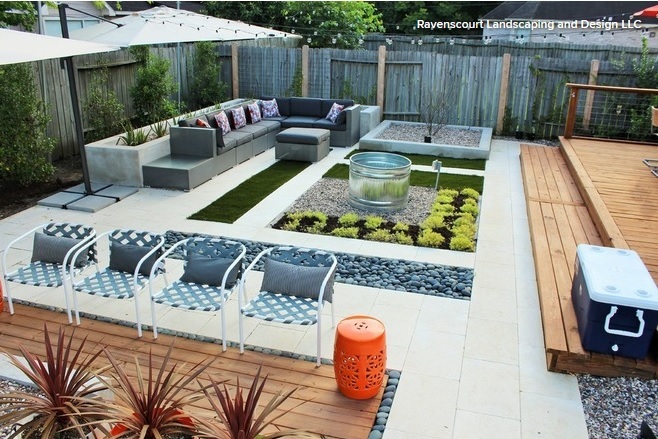 It is a good mix of hardscape with striking fountains and water features at every turn. I read that this year they have added 500,000 holiday lights, I can only imagine how lovely it would be in the evening! 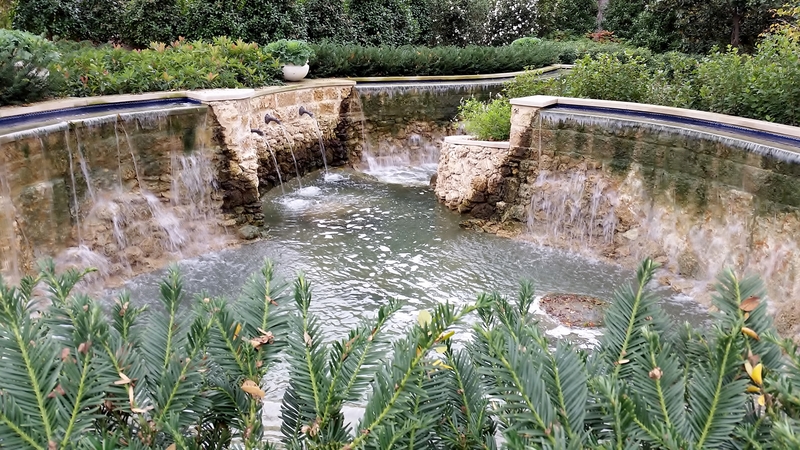 Here is a larger picture of the amazing water feature in the bottom right corner of the photograph above. 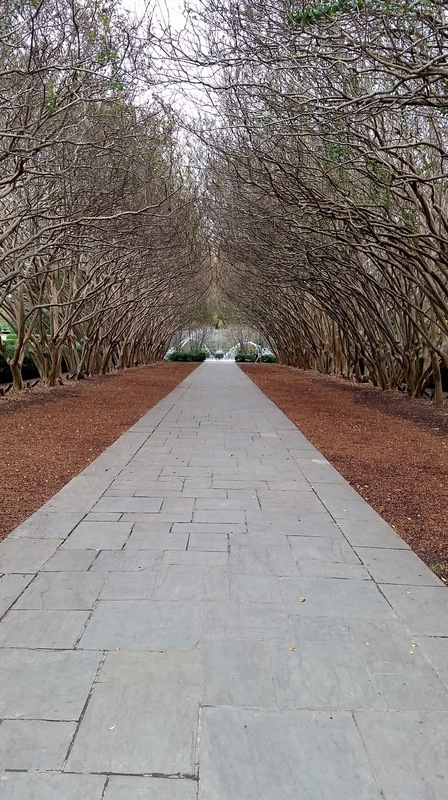 One of my favorite parts of the garden is the Crape myrtle allée. I had some fun making a Instagram post with this too! 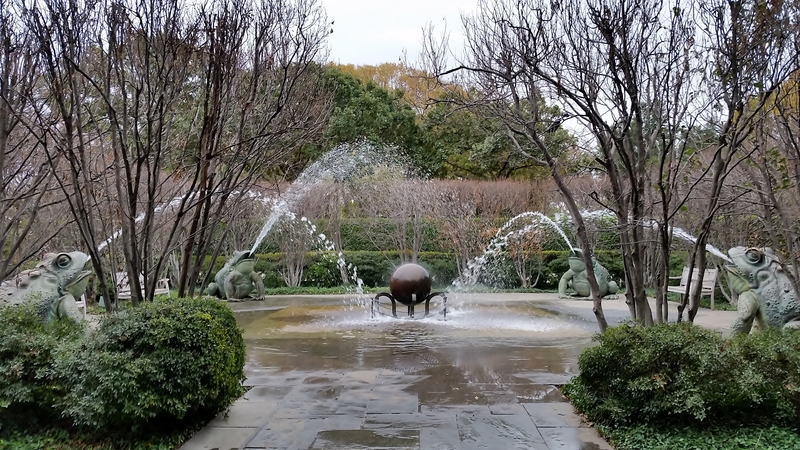 The fountain with 4 frogs at the end is very clever and I enjoyed ducking under the water. They still had the huge display of pumpkins. Shawn got this shot of the state of Texas. The orange one, within the confines of the state, shows you approximately where Dallas is within Texas. 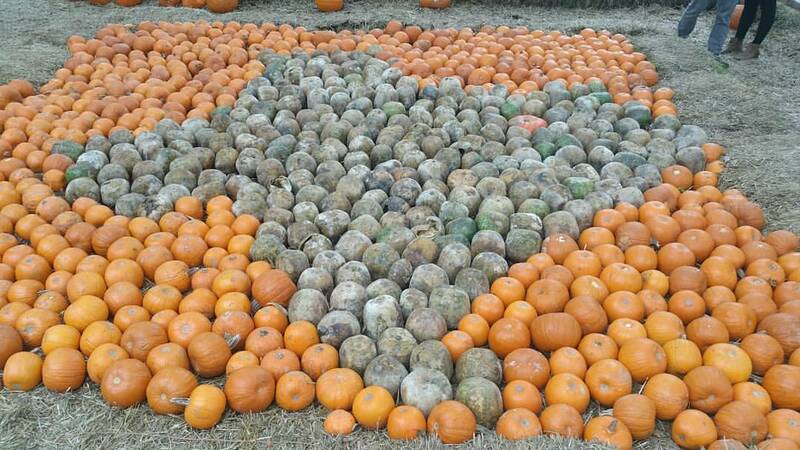 (About seven pumpkins down is Houston!) Several of the winding paths lead you into forested areas of deep shade. 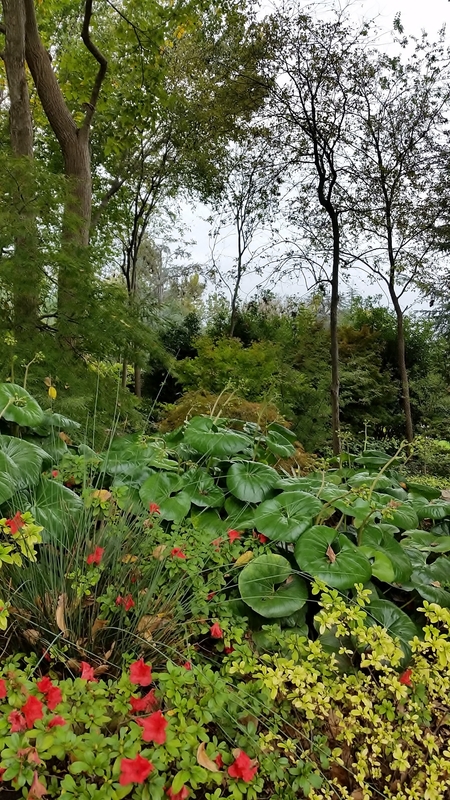 I love shade plants especially Giant leopard plant, Ligularia tussilaginea ‘Gigantea’. They remind me of tractor seats. They are full of buds and should be blooming very soon. Being proper tourists we took a few pictures of each other. 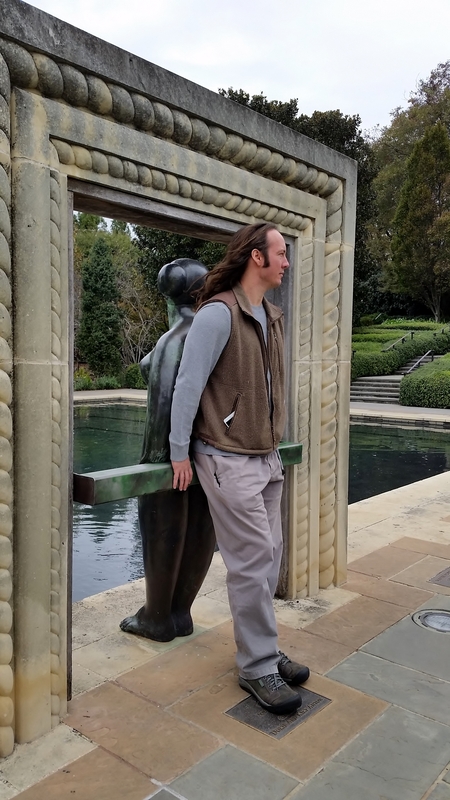 Here is Shawn mirroring the beautiful bronze sculpture in the section called A Woman’s Garden. 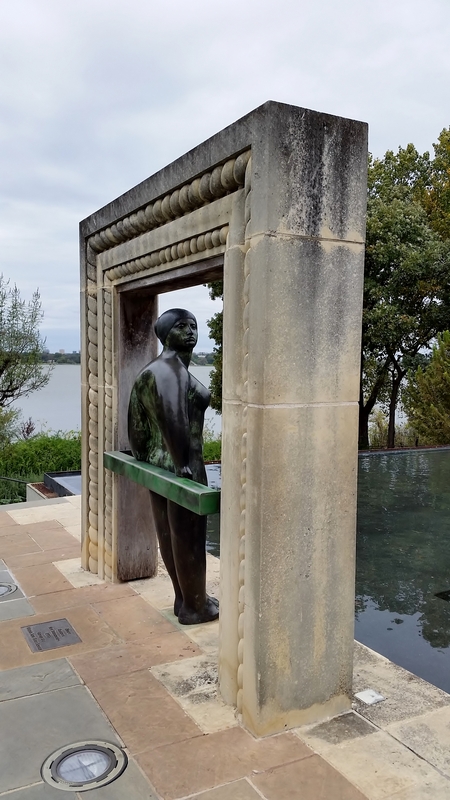 I love this part of the garden and the way you can look thru this sculpture and see the lake behind and the trees framing and reflected in the water below. 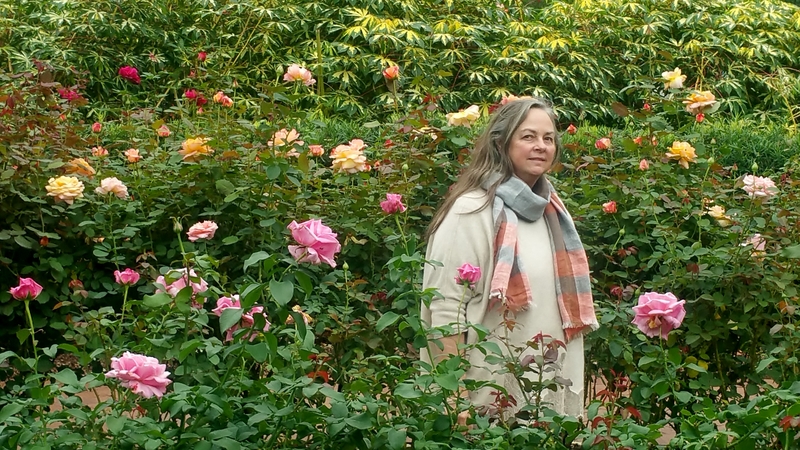 And here is Shawn’s picture of me in the rose garden. I couldn’t believe all the roses in bloom and the beautiful full Variegated Tapioca ‘Variegata’,Manihot esculenta in the background. They had grown so quickly that many of them were tressed to stand up. I hope you find time to make a trip to the Dallas Arboretum. I know we will go back to see it in other season. 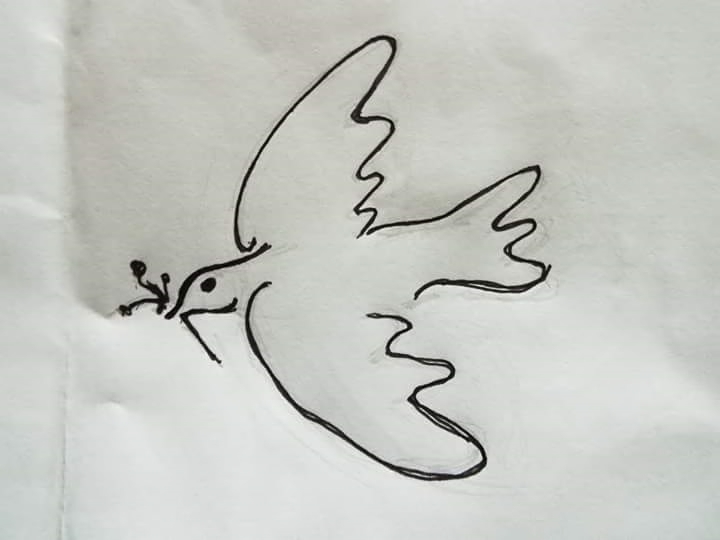 As I end this post I am sending prayers and thoughts of peace out into the world! I’m glad you had a chance to visit Dallas Arboretum. It looks like a fairly wintry day from the leafless crepe myrtles and gray skies, but I’m glad you found plenty to see, even so.